This year's event will take place Saturday, February 17th at Willie Dunn's Restaurant at the Okemo Valley Golf Club. 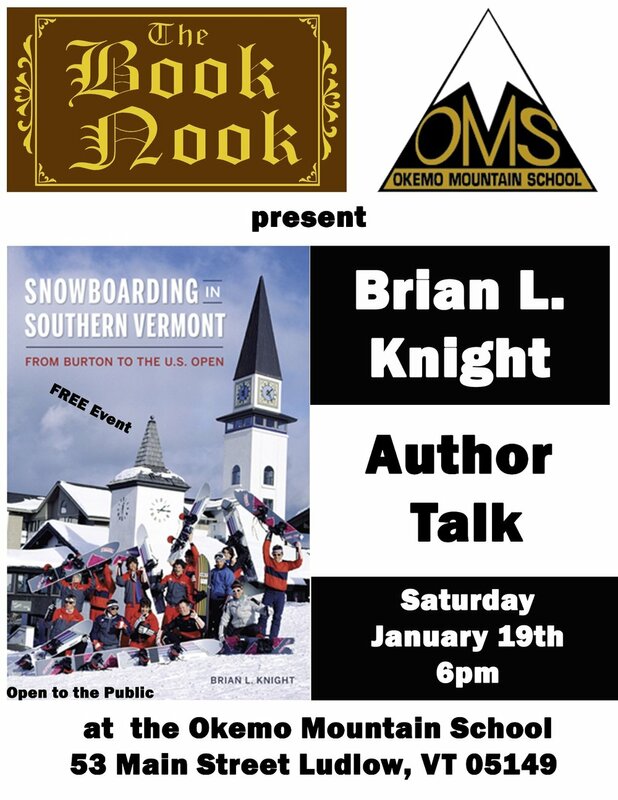 Join us for an author talk with the author of Snowboarding in Southern Vermont, Brian L. Knight! There will be a talk given by Brian Knight, followed by time for questions. The event begins at 6pm in the OMS Fitness Facility and is being sponsored by The Book Nook. During the 1980s and 1990s, the "Manchester and the Mountains" area of Vermont was the epicenter of the fledgling sport of snowboarding. With the presence of Burton Snowboards, the U.S. Open Championships and one of the earliest machine-built halfpipes at Stratton Mountain, the local population led the vanguard as the sport ventured from the fringe to mainstream. Ranging from Olympic gold medalists to backhoe operators and converted skiers, locals contributed immensely to the development of the sport. Author Brian Knight details the birth, growth and development of a new worldwide sport from humble beginnings in southern Vermont. Students will be on Winter Break from December 20-January 2. We hope everyone enjoys the holiday season; see you in 2018! Loving the unadulterated joys of winter is something we all have in common with the late, great Warren Miller—who helped create and capture the magic of skiing. This year, new and veteran athletes alike pay tribute to the man who started it all in Face of Winter, the 69th installment from Warren Miller Entertainment (WME), presented by Volkswagen. Learn more at warrenmiller.com. Explore warrenmiller.com for more. 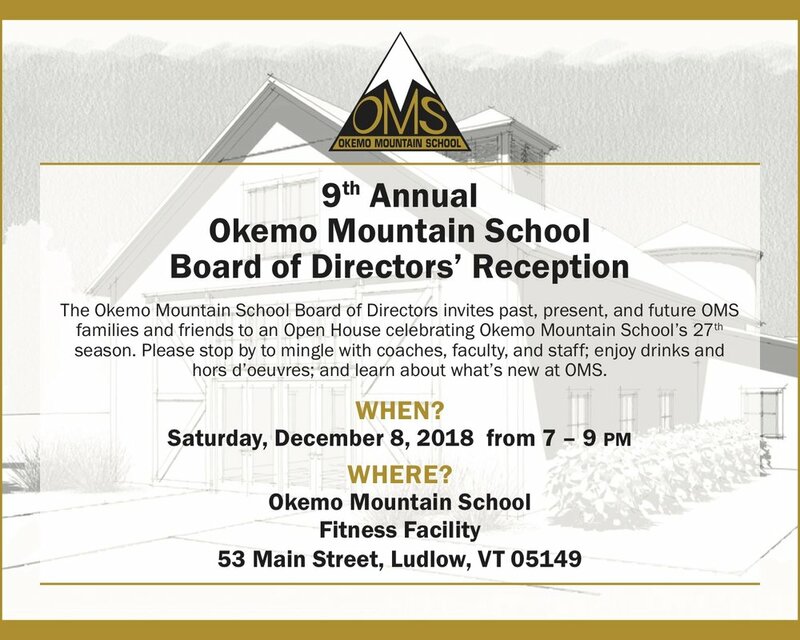 Calling all Okemo Competition Center and OMS alpine athletes! The 2018 Okemo Fit Day is Sunday, September 16th from 9 am - 1 pm on the Okemo Mountain School Front Lawn at 53 Main St in Ludlow (rain location: Jackson Gore Ice House). Save the date to join us for a great evening of sand, surf, and awesome food on the beach in Fairfiled, CT! Okemo Mountain School is the grateful recipient of proceeds from the B2VT Bike Ride on June 9, 2018. It is a crazy hard 132-mile bike ride from Bedford, MA to Jackson Gore. We are looking for volunteers for manning the finish line. Can you help out? Sell your old gear (please no skis, boots, or bindings older than 7 years) at our annual Ski Swap on consignment. 25% of the selling price goes to Okemo Mountain School – the remainder you will receive in a check about 3 weeks after the swap. You may also choose just to donate your equipment – all donations are tax-deductible.